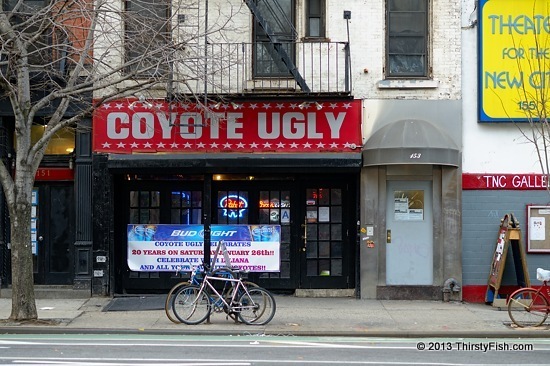 Coyote Ugly is a bar in NYC which gave its name to the 2000 movie with the same name. No, I didn't see, and don't plan to. Coyote Ugly has also become a term made famous by the movie: " It describes a person, usually a female, who is so physically undesirable that her partner, usually a male, is willing to gnaw off a limb she is sleeping on in order to escape rather than to risk waking her. The male will usually find himself in this situation when, after a night of heavy drinking, he wakes up the next morning in the bed of a woman he does not remember meeting and has no desire of getting to know better". Coyotes are said to chew off their legs to escape a jaw-trap. We have become a nation obsessed with beauty, spending over 10 billion dollars annually on cosmetics, breast implants, lipoplasty, tummy tucks and etc. We increasing judge people for how they look (and what they do), rather than who they are. We discriminate against the ugly. We need to rethink what really is "ugly". In 1912 The Perfect Woman was from Brooklyn, New York. The 24 year old Elsie Scheel was five foot seven, 171 pounds, with a pear shape figure and measurement of 35-30-40. She ate "only what she wanted when she wanted it". According to the paper she did not have "a single defect".